The Microsoft Outlook Hotmail Connector version 14.0 for Microsoft Office 2010, an upgrade from Outlook Connector 12.1, has been officially released. My Digital Life blog has previously published the leaked Outlook Hotmail Connector 14 for Office 2010 for free download. Outlook Hotmail Connector v14.0 has the full product build version of 14.0.4760.1000. Outlook Hotmail Connector, a new name change from Outlook Connector, allows user to access and manage Windows Live Hotmail or Microsoft Office Live Mail accounts, including email messages, contacts and calendars for free from within Outlook. According to Outlook 2010 blog, Outlook Hotmail Connector 14.0 introduces several improvements and enhances reliability of connection to Hotmail, and fixes various bugs and issues such as blank messages being synchronized to Outlook. The standalone setup installers of Outlook 2010 Hotmail Connector 14.0 can be downloaded from Microsoft Download Center in both 32-bit (x86) and 64-bit (x64) flavors, or just download using the direct download links from Microsoft’s server below. Several send/receive issues are fixed. The Outlook junk email filter within Outlook is turned off for Hotmail accounts (this was erroneously flagging good mail as junk). 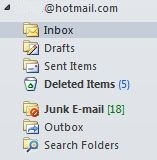 Junk messages are now detected at the Hotmail mail server. Any entries you made in Outlook for the junk email filters (Safe Senders, Blocked Senders, and Safe Recipients) continue to work correctly and synchronize between Outlook and the Hotmail mail server. Fixes for hangs and crashes experienced when sending meetings using the Hotmail Connector and when adding a new Hotmail account to an existing profile. Fix for an issue where Windows Live contacts’ birthdays and anniversaries shifted by one day when synchronized with Outlook. Fix for an issue that blocked synchronization of the Category property in an Outlook contact with Windows Live. Users using Outlook Connector 12.1 can directly install Outlook Hotmail Connector 14.0 without uninstalling the 12.1 version. Users of older version of Outlook Connector for Office 2003 or Office 2007 may also receive notification dialog message to upgrade to latest version of Outlook Connector for Office 2010. However, some users reported that Outlook Connector upgrade fails. Installing via the above standalone offline setup installer avoid, and fix the issue. Tip: For users who just want to download emails from Hotmail to Outlook, Outlook Connector is optional and not necessary, as there is free POP3 and SMTP support on Hotmail. Check out all Office 2010 downloads and resources available.